Black Lives Matter-Syracuse leads 500 to protest at Police Department. Some 500 people challenged racism and police terror in Syracuse, N.Y., on July 18, in a militant, high-energy and unified march. 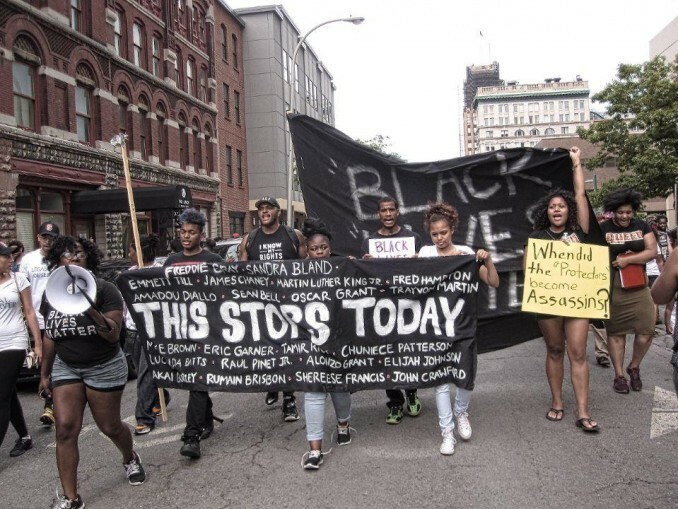 According to their press release, the newly formed Black Lives Matter-Syracuse group called the event “in response to ongoing murders of Black people of all genders, sexualities, abilities and ages” across the U.S. and to protest “police brutality against Black residents” in Syracuse. Marchers gathered at a downtown emblem of Syracuse’s abolitionist history: the statue of William “Jerry” Henry, who had liberated himself from slavery. In 1851, federal marshals arrested him in Syracuse under the Fugitive Slave Act, intending to return him to enslavement. But hundreds of abolitionists rushed to his aid, broke down the jail doors and freed him. In recent years, Black Syracuse residents who have been beaten, sexually attacked or died while in police custody include Terry Maddox, Maleatra Montanez, Johnny “Hud” Williams, Chuneice Patterson, Lucinda Batts, Alonzo Grant, Elijah Johnson, Brad Hulett, Edward Jones, and Raul Pinet Jr.
Also present were many white allies, including churchgoers from Central Square, a conservative suburb. Young people from Buffalo travelled hours to join, and members of Ithaca Standing Up for Racial Justice (SURJ), a white allies’ group, were there. BLM-Syracuse activists led marchers through the streets, chanting demands for the shutdown of police brutality, mass incarceration, economic inequality and “the whole damn system.” Speakers vehemently repeated those demands and others in front of City Hall and the “Justice Center,” which houses the Syracuse Police Department. The BLM organizers also demanded an independent investigation into the most recent “death by police” in Syracuse of Terry Maddox. A cop killed the African-American man in June at a Father’s Day cookout on the West Side. Numerous witnesses say Maddox had been unarmed. An outraged neighborhood crowd rose up and fought with police for half an hour after the shooting. A dozen people were subsequently arrested and charged with the offense of “inciting to riot,” for simply shouting during the melee. Authorities continued a pushback against community outrage when cops in SWAT gear, accompanied by an armored vehicle as “backup,” ransacked a neighborhood home. The Department of Homeland Security tried to intimidate the planned march by “warning” the department’s downtown employees and closing the Federal Building early, initiating a wave of downtown business shutdowns. When BLM organizers announced their program was at an end, exhilarated protesters did not want to leave. Many stayed for another hour. Some marched to other areas downtown and returned to hold signs. People in passing cars and buses honked and shouted agreement. Everywhere in front of the Syracuse Police Department, conversations were underway for future actions against racism and police brutality.